» A Movie Review by Walter Albert: THE MOLLYCODDLE (1920). A Movie Review by Walter Albert: THE MOLLYCODDLE (1920). THE MOLLYCODDLE. Fairbanks-United Artists, 1920. Douglas Fairbanks, Ruth Renick, Wallace Beery. Director: Victor Fleming. Shown at Cinecon 44, Hollywood CA, Aug-Sept 2008. The films that Fairbanks made before the success of Robin Hood propelled him into the big-budget historical epics for which he is now remembered may not be as visually sumptuous as his later work, but they are every bit as entertaining. In this, his third United Artists release, Fairbanks plays Richard Marshall V, the descendant of a line of risk-takers and adventurers, who is the “Mollycoddle” of the title, a term coined by Theodore Roosevelt to characterize a spoiled, frivolous young man. Attracted to a young woman in Monte Carlo, he insinuates himself into her group, a party formed by villainous diamond smuggler Henry Van Holkar (Wallace Beery) that is shortly to set off as a cover for an Arizona tour where Van Holkar will pick up another supply of diamonds for delivery to Amsterdam. The Arizona excursion proves to be the making of Richard, who performs spectacular stunts that prefigure the Fairbanks roles shortly to follow. The most spectacular stunt, in which Marshall leaps from a cliff to a tree, was filmed with a double because of injuries Fairbanks sustained in an earlier stunt. The doubling is seamlessly shot, with the dastardly villain foiled and the intrepid hero and fair maiden reunited. All of the early Fairbanks films are wonderfully entertaining; ten of them, including The Moddycoddle, I am delighted to say, are included in a reecnt DVD set from Flicker Alley. Editorial Note: In that set referred to by Walter are: His Picture in the Papers / The Mystery of the Leaping Fish / Flirting With Fate / The Matrimaniac / Wild and Woolly / Reaching for the Moon / When the Clouds Roll By / The Mollycoddle / The Mark of Zorro / The Nut. I’ve yet to make my way through all of the films in the set that Steve mentions but I was surprised to see that “The Mark of Zorro” was included. It was his first feature-length film (12 reels), where the majority of the earlier films in the set were five reels. However, in 1919, with “The Knickerbocker Buckaroo,” which was seven reels, Fairbanks was clearly testing the limits of his successful format, and “The Mollycoddle” (six reels) strikes me as somewhat constrained by its length, with a character and plot development that might have justified a more expansive treatment. However, that’s a debatable thesis. Although his last contemporary comedy, “The Nut,” was released in June 1920, it was made after the completion of “The Mark of Zorro, with Fairbanks, uncertain of the reception his feature might face at the box office, electing to delay its release until November 1920. Fairbanks” (University of California Press/Academy of Motion Picture Arts & Sciences, 2008), which was recently remaindered by Daedalus books for under ten dollars. 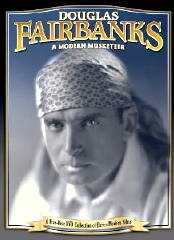 The early Fairbanks films have a pace that was sadly lost in the later films. Thanks for reminding us, Walter.